This tutorial is going to be a ton of fun. 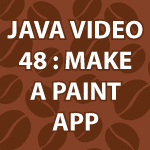 Today I’ll show you how to Make a Java Paint Application! One of you guys asked me to do this and it gives me a great opportunity to review and cover new topics all at once. Somethings I cover that you may want to brush up on include using the Java Box Layout, Java ArrayList, and Java Graphics2D. please make something for collision detection as well. I am learning Design Patterns and I noticed that those kind of software is the best way to learn how to use Design Patterns. Can you please make a case study video tutorial of a paint application by using Design Patterns ? I think it will help newbies like me, how to apply OOAD and Design Patterns in real world projects. It will be very helpful, thank you very much ! All the time when I made a mouseListener and checked(with the simple System.out.println method) whether the repaint method worked when I release the mouse or not I got no result. I put the System.out.println method in the paint(Graphics g) method, but it still doesn’t print something in the console when I repaint. Do you have any idea what probably may have gone wrong? Btw thanks for the time you spent with helping people! I appreciate it! I only have used a part of your code but I tried to change it a little bit and play with it. I tried to repaint it in the timer that I used, a schoolmate told me that I should use paintComponent. He didn’t even know that there is just a paint method. I’m still very glad there’s someone who want to help me(on the web)! Just made another version that works. I showed my friend who’s good at programming, but even he couldnt find a solution. We created a new file. I’m glad it now works. And again; Thanks for your tutorials! You are very welcome 🙂 You will learn a great deal by taking my code and expanding on the possibilities. Can I use this code for my assigment what do I need to change in this code to make it my own ? Ok forget that last question,managed to solve it. My problem is..al I do it only draws rectangles. Any idea why? I have a tutorial on how to install Eclipse for Java. Maybe there is an installation problem because of your other question? Sorry, but I’m not sure. if i have to guess..you may not have setup the environment variable paths on the computer your using. I’m using Eclipse. I can’t understand why they wouldn’t open. I just tested this one and it worked. Sorry about that.